I'm finally getting around to post about the final two days of my week-long trip across Tennessee. Thursday found us driving to Lynchburg, Grundy County, through Chattanooga, and on to Monroe County and Loudon, TN before settling for the evening in downtown Knoxville. Lynchburg was our first stop, and most of you know it as home to the Jack Daniels Distillery. I've been here twice and will post about it separately one of these days, but for obvious reasons we didn't stop here while on our business trip. Next, was Grundy County which is home to some of my favorite hikes in the Savage Gulf State Natural Area and South Cumberland State Park. Later in the day, we drove over to Sweetwater, TN- home to the Lost Sea. 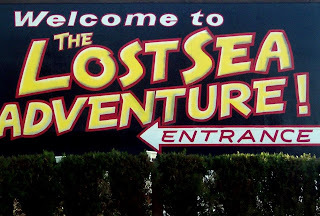 I've never been to the Lost Sea, but it calls out to me with its fascinating history. It's listed in the Guinness Book of World Records as the largest underground lake in the United States. Over the years it has hosted cockfighting, an underground dance floor, and moonshining activities. I HAVE to return and visit one day. I would love to see the inside of that old hotel, and take some pictures. It is so neat. The man I was with had been inside and said there wasn't much in there besides trash. He did say that there were some cool fixtures that were original to the hotel. I asked him if the whole place rattled when a train went by and he said it did. I'd love to see the inside as well.